Sony recently announced the new IMX318 Exmor RS™ image sensor for smartphones and other devices that require increasingly better cameras and thinner form factors. The IMX318 is a type 1/2.6 stacked CMOS image sensor with 22.5 effective megapixels, and it boasts a more compact size, greater image quality, and higher performance. This new Exmor RS is the industry’s first*1 to be equipped with built-in high-speed hybrid autofocus (“AF”), as fast as 0.03 seconds*2, and built-in 3-axis electronic image stabilization technology for video. The planned shipment date for this new CMOS image sensor is May, 2016. Sample price (tax not included) of one IMX318 type 1/2.6 22.5 effective megapixel* stacked CMOS image sensor is 2,000 yen (17.5888 US Dollar at the current exchange rate). Tokyo, Japan – Sony Corporation (“Sony”) is announcing the commercialization of a new Exmor RS™ image sensor for smartphones and other devices that require increasingly better cameras and thinner form factors. The IMX318 is a type 1/2.6 stacked CMOS image sensor with 22.5 effective megapixels, and it boasts a more compact size, greater image quality, and higher performance. This new Exmor RS is the industry’s first*1 to be equipped with built-in high-speed hybrid autofocus (“AF”), as fast as 0.03 seconds*2, and built-in 3-axis electronic image stabilization technology for video. 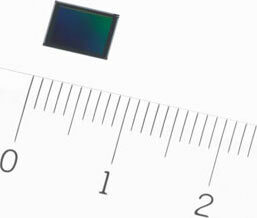 Sony aims to begin shipments for this new CMOS image sensor in May, 2016. *2: The time it takes to bring the picture into focus when the distance from the sensor surface to the subject is reduced from 2m to 2cm, given high-light conditions (2,000lux or higher). The IMX318 boasts a stacked structure and the industry’s smallest unit pixels, which measure 1.0μm (micrometers) in size. With this, the image sensor achieves a compact, type 1/2.6 size suitable for inclusion into smartphones, while still realizing a high resolution of 22.5 effective megapixels, among the top in the industry. This new image sensor not only boasts enhanced resolution, but it also matches its predecessor in image quality despite the IMX318’s smaller size and unit pixels (IMX230 predecessor model: type 1/2.4 sensor with 1.12μm unit pixel size). Additionally, Sony has succeeded in equipping the IMX318 with cutting-edge digital imaging features, namely high speed built-in hybrid AF and 3-axis electronic image stabilization for video, a first*1 for the industry. With this image sensor, the user can capture image stills of those decisive moments reliably in high quality, as well as high resolution video without fear of blur. Hybrid AF, which merges image plane phase detection AF with contrast detection AF, has previously been realized through the combination of an image sensor and an application processor. But with the IMX318, Sony has created the industry’s first*1 stacked CMOS image sensor with hybrid AF built into the sensor’s internal signal processor. The IMX318 leverages Sony’s high-speed AF technology that has been honed over many years, boasting an AF as fast as 0.03 seconds*2 (and as fast as 0.017 seconds when shooting video at 60fps). With this power in hand, the user can capture those decisive moments reliably in focus, whether shooting stills or video. 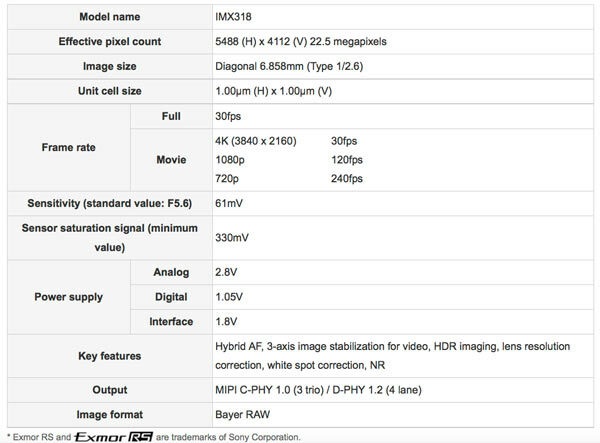 With the IMX318, Sony has also created the industry’s first*1 stacked CMOS image sensor with image stabilization functionality built into its internal signal processor. This sensor leverages the image stabilization technology that Sony has cultivated over its years developing cameras, realizing smooth 4K*3 videos with little camera shake by making effectively use of the signal output obtained from the external 3-axis (pitch, yaw, and roll) gyro sensor*4. 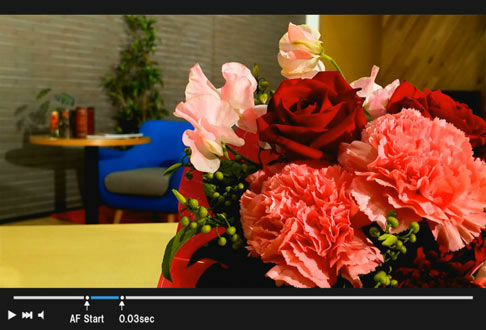 Sony’s unique image stabilization technology incorporated into the IMX318 corrects not only camera shake, but also lens distortion, making for more beautiful videos. Furthermore, because image stabilization is achieved by processing within the hardware of the image sensor, less power is used than when it is accomplished by software processing in the external application processor. Since it enables smooth video shooting, this image sensor is suited for incorporation into not only smartphones, but also a variety of other products that tend to generate substantial camera shake, such as aerial drones used for image capture. *4: Gyro sensor: instrument that determines angular velocity through inertia. Sony elected to adopt the MIPI (Mobile Industry Processor Interface) Alliance’s latest C-PHY 1.0/D-PHY 1.2 specifications for this image sensor’s interface. With this interface, the IMX318 is able to achieve more power efficient and faster data transmission from the image sensor to the application processor. 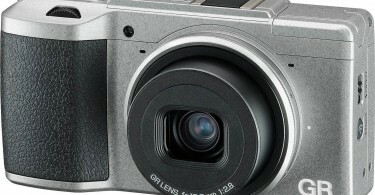 As a result, even at the high resolution of 22.5 megapixels, transmission is realized for all pixels at 30fps. This enables seamless switching between high resolution video and still image photography, realizing the best of both worlds. Since the image sensor can transmit greater-than-4K resolution images for all pixels to the application processor, the user can capture 22.5 megapixel still images even while in the middle of recording video in 4K*3 at 30fps.